The hip is a ball and socket joint in which the head of the femur (the leg bone) fits into the pelvis. There are 3 hip bones: the ilium, ischium and pubis that fuse together in adolescence, to create the butterfly shaped wings of the hips on each side of the body. Below each ilium is a ring structure made of the ischium and pubic bones. When you put your hands on your hips you are actually resting on your pelvic bones. The sacrum is the heart shaped bone in the back of the pelvis. It is connected to the pelvis by the ilium. This is called the sacroiliac joint. The hip/pelvic bones (the large, butterfly shaped group of 3 bones), and the sacrum form a pelvic ring. 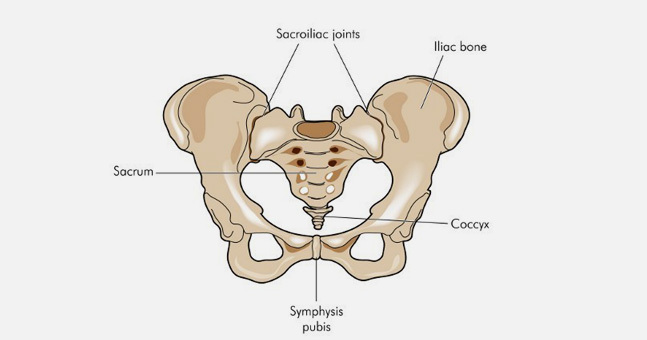 The left and right sides of the pelvis are joined together by the symphysis pubis (SP) made of cartilage in the anterior, and posteriorly with the sacrum at the sacroiliac (SI) joint. The pelvic ring protects the organs in the lower abdomen from injury. The ring is inherently structurally stable and all the major nerves, blood vessels are within the pelvic ring. Because the pelvis is a ring-like structure, when one part of the ring is injured, it will affect another area of the ring. What are posterior pelvic ring fractures? Posterior injuries are fractures to the ilium, partial and complete SI joint disruptions, or sacral fractures. Posterior ring fractures are difficult to diagnose and only recently have researchers begun to recognize them, and establish diagnostic criteria. Pelvic ring fractures are rare, comprising only 3% of all fractures. Posterior ring fractures of the SI joint, often called crescent fractures. The SI is the joint between the sacrum and the pelvis. The function of the SI joint is to distribute weight and stress forces across the pelvis and into the legs. The SI joint is stabilized by ligaments, and many muscles. What causes a posterior ring fracture? SI joint and sacral fractures are caused by falls on the hip or buttocks, sports injuries, high- impact injuries like traffic accidents, when a pedestrian is hit by a car while crossing the street, falls from a high place, and crush injuries. Most are due to an auto accident, and affect women and men of all ages. High- impact fractures are a medical emergency due to the risk of catastrophic hemorrhage and death. However, adolescents and the elderly can experience a hip fracture with only low impact injuries. Teens can suffer a hip fracture from a sports injury, or even jogging. Low-impact fractures are more common in women. What are the different types of low- impact posterior pelvic fractures? Fragility Fractures of the sacrum are common and almost 25% of them are associated with loss of balance, walking problems, and weakness in the legs. Pelvic fractures can occur spontaneously. Frequently, an elderly person who falls at ground level onto the side of the hip can experience a hip fracture. Often the fracture is caused by a trivial traumatic injury, and the bone breaks because it is of poor quality. These fragility fractures cause immobility and impair quality of life. Men are most often the victims of high-impact posterior ring fractures. But, low-impact posterior pelvic fractures affect people over the age of 60. Post-menopausal women with osteoporosis are the most vulnerable. Pain that is aggravated by movement, inability to walk or put any weight on the hip, swelling and bruising. SI joint fractures may also cause a limp. How is a posterior pelvic ring fracture diagnosed? These fractures are difficult to diagnose because the symptoms are similar to those caused by low back problems. Clinical evaluation will include examination of sensory and motor function. Diagnosis of damage to the lower sacrum requires a rectal exam and specific testing. X-rays will be ordered, but only one third of cases can be diagnosed with an x-ray alone. A CT scan is the primary diagnostic tool. Diagnosis of SI joint problems is focused on pain. Most describe the pain as a dull ache or stabbing pain, through the back and buttocks, that is worse after sitting for long periods or with twisting and rotational movements. However, SI joint injuries may not cause immediate pain and many patients may not connect their pain with injury. Some patients say their pain began spontaneously, while on exam studies report that almost 60% of these patients had some traumatic injury. That is why you need a surgeon who understands the diagnosis and treatment of SI joint conditions. They will employ a range of diagnostic exams to determine the extent of injury. Posterior Pelvic Ring Fractures frequently pose a problem with stability. Low- impact posterior pelvic ring fractures that are stable may be amenable to conservative treatment. Most sacral fractures can be successfully treated without surgery. But treatment is determined by the degree of instability. Conservative treatment includes avoiding weight bearing on the affected leg, bed rest and immobilization followed by the use of walking aids. Pain medications and anti-coagulants may be prescribed to reduce the risk of blood clots forming in the leg and pelvic veins. If pain and mobility are not improved, stabilization surgery will be considered. However, posterior fractures of the ilium or SI joint require surgery when instability is present. If surgery is needed, minimally invasive procedures are favored. What is important to remember is that these low-impact fractures of the sacrum and SI joint are often misdiagnosed as a lumbar spine problem. Only an expert in these types of fractures like those at Ortho Illinois have the knowledge, skills and experience to recognize, diagnose and treat low or no impact SI joint and Sacral fractures.